I arrived into San Francisco one June night in 1979 with a few dollars and a dream like most Irishmen who leave. I knew no one and cared less, I was in America, exactly where a young Irish emigrant should be. No pessimist ever crossed the Atlantic and I could not wait to get started in the new world so different from the cramped and narrow country I had left behind. San Francisco had not been my first stop, that was Chicago but after a freezing winter there, there was no going back. As a sports fanatic I immediately gravitated to supporting the local teams, to find common cause with the folks I was working with on construction sites and the Irish community. American football and baseball were gobbledigook to me. Back then you rarely saw it on TV overseas. To this day I do not know the finer point of baseball, a game, alas, I have never warmed to as it reminds me of watching cricket which makes paint drying look exciting. Football was a different matter, a chess game between two coaches as superb athletes vied and probed for every advantage. The San Francisco 49ers were one of the worst teams in football at the time, coming off a 2-14 season I think. They made the modern day Jets look successful. After a year they were 6-10 in 1980, not bad, but still a long way from the top notch sides such as Dallas and Pittsburgh. Then in 1981 out of nowhere the 49ers with Walsh running the new fangled West Coast offense and Joe Montana destroying team after team with unlikely wins and comebacks, the 49ers shocked the football world and won the Super Bowl. I was along for the ride, hooked by the unlikely story and falling in love with the combative underdog style and last-minute heroics such as ‘The Catch’ by Dwight Clark in the end zone that defeated Dallas, then the royal princes of football. I had found my team and have never relinquished them since. I was in Stanford Stadium in 1984 paying $200 that I could not afford for a ticket when they defeated Miami in the Super Bowl in a game that proved an anti climax because they were so dominant. They have won all five super bowls they have played in - an amazing record. Soon after, I came to New York but never stopped loving the 49ers, even when the bad times came as they inevitably did. 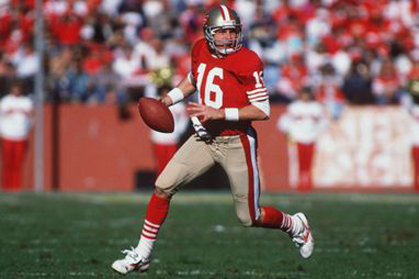 I met Joe Montana at a Notre Dame game about ten years ago and was as awestruck as a teenager. I read an interview with him where he talked about how the field and the action seemed to slow down when he had the ball and he always thought he had lots of time to find his man. Such is the preserve of great athletes. So today is a special day as this brand new version of the 49ers play in the Super Bowl and I will proudly wear my Montana jersey and cheer them to the hilt. So go ‘Niners’ and bring back those wonderful memories back from this emigrant who will never forget what they meant to him.